In the news: Pi weather station; BBC Micro Bit boards, and Picademy update. The Raspberry Pi Foundation and IT titan Oracle are collaborating on a new project designed to help schools encourage students to learn to program. The Oracle Academy Raspberry Pi Weather Station project will provide 1000 Raspberry Pi weather station kits for schools around the world. The program is intended for students in the 11-16 age group. In addition to assembling the kit, the students will write their own code for tracking weather conditions. Online technical support will be available through the project website. According to Eben Upton, "This ambitious project adds another string to the Raspberry Pi bow, using the Raspberry Pi to introduce children to the art of data management and SQL. The kits themselves are really exciting, containing everything you would expect from a fully-functioning weather station. We're confident that students will find the project a very engaging way of learning new and useful skills, and that they'll have a lot of fun in the process." The BBC is reportedly planning to give a very simple, single-board computer to every single 12-year-old child in the UK. The program is part of the UK's "Make it Digital" initiative, which intends to "inspire a new generation to get creative with coding, programming and digital technology." 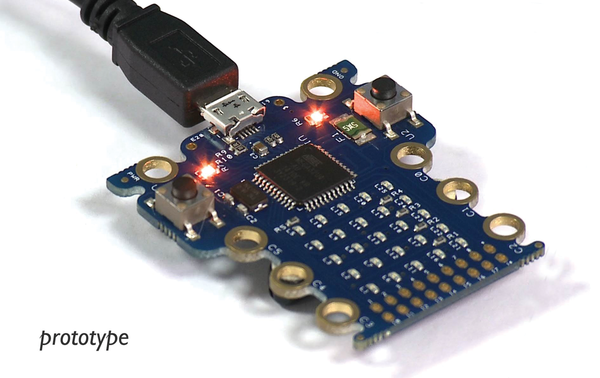 The small computer has the code name Micro Bit, as a send up to the iconic early home computer known as the BBC Micro. (The developers are still looking for a final name for the system, which is in development.) The new system will be much simpler than a Raspberry Pi, but it will come with Bluetooth support to interact with wireless peripherals. A rack of 5X5 LED lights will offer immediate output for scrolling messages and patterns. The system will support Python, C++, and Microsoft's TouchDevelop environment. The free system is intended to get 12-year-olds interested in coding, with the hope that they will move on to the Raspberry Pi and other open hardware systems. After losing one weather station to tropical winds, the author reboots and designs a PCB that connects to an Arduino and monitors weather instruments.